Greenies dental chews is joining with Banfield Pet Hospital in cooperation with PetSmart to promote pet oral health. Participating PetSmart stores will host Pet Dental Checkup Days March 2 and 3 from 2 to 4 p.m. Banfield Pet Hospital veterinary technicians and Greenies representatives will facilitate free in-store oral health assessments for dogs and cats at participating PetSmart stores that have a Banfield Pet Hospital. Pet parents will also receive product offers and educational take-home tools to help them provide good pet oral health care. Dental disease continues to be the most common health condition affecting dogs and cats in the United States. However, it's easier than many pet parents may think to recognize and prevent oral health issues in their pets, according to the companies. The Pet Dental Checkup Days event will help pet parents better understand the significance of good pet oral health. Along with the free dental assessment, the event will emphasize the importance of regular professional oral care by a veterinarian and at-home preventive care through daily tooth brushing or proven efficacious products like Greenies dental chews and treats. "The Pet Dental Checkup Days event offers pet parents the expertise of dedicated veterinary professionals from Banfield Pet Hospital, supported by the leading dental treat brand and pet specialty store, to collectively educate pet parents on their pets' oral care and how essential it is to the overall health of pets," said Monica Barrett, senior corporate affairs manager for The Nutro Company, which owns Greenies. 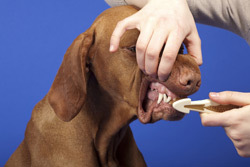 "Brushing Dog's Teeth photo from Shutterstock"